Key messages: Climate change adaptation for coffee and cocoa farming requires low cost and multipurpose solutions, such as shade trees. Selecting appropriate shade trees is paramount for maximizing tree-based ecosystem services while minimizing disservices. 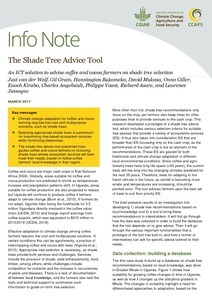 The shade tree advice tool presented here guides coffee and cocoa farmers on choosing shade trees whose ecosystem services will best meet their needs, based on fellow coffee farmers' local knowledge in their region. van der Wolf J, Gram G, Bukomeko H, Mukasa D, Giller O, Kriabo E, Angebault C, Vaast P, Asare R, Jassogne L. 2017. The shade tree advice tool. CCAFS Info Note. Copenhagen, Denmark: CGIAR Research Program on Climate Change, Agriculture and Food Security (CCAFS).